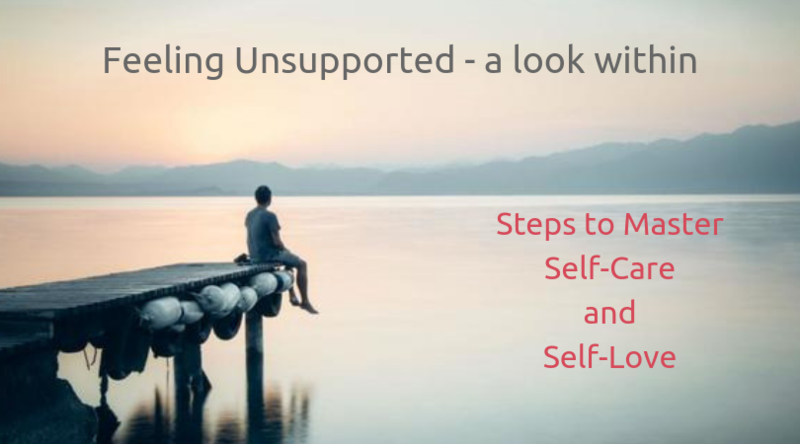 Learn 3 questions to ask yourself when you are feeling unsupported and the steps to master self-care and self-love. Many times we feel we’re not getting the support we want or deserve in life, our career or our relationships. Maybe we’ve never felt supported by our friends or family. Maybe we don’t feel supported by our peers or co-workers. Maybe we don’t even feel supported by our partner or our children. This can leave us feeling drained, unfulfilled and despondent, like we’re moving through life without much fuel to keep going.During my adolescence and early adulthood, this was a huge struggle for me. I rarely found a place or group of friends where I felt like I “belonged” and, therefore, I didn’t feel supported. When I did feel supported by others, it only lasted for a few days or weeks before it dissipated. Today, this has shifted, my life is much different. I feel much more supported in my current relationships and connected to others. There are still moments when I feel like I did growing up, but I’ve realized that opening up to support is a life-long journey. It’s an ongoing process of healing old wounds and allowing ourselves to become something new. Is my story preventing me from receiving support? Do you tell yourself stories like “Nobody understands me,” “He can’t understand me because he hasn’t experienced what I’ve experienced,” or “I always have to take care of others and nobody can take care of me”? Or, do you repeatedly tell yourself, “I am never supported in my relationships”? Whatever your specific story is, it blocks you from receiving the support you desire. I’d think this at work when I needed extra help or a day off, so I’d feel hesitant to communicate this to coworkers. I’d also think this when going through tough times, which made me feel scared to open up to friends, so none of them would know what I was feeling. When we acknowledge our stories, we are then able to shift our perception and open ourselves to receiving support from others. Am I reaching out to others for support? Often when we feel like we are not receiving what we desire from others it’s because we are not open to receiving. It’s as if we have a store front set up for business, but we have locked the doors! Be sure to tell others when you are going through a difficult time. Ask people for help rather than to try to figure it all out on your own. By letting people know that we are seeking support, we’re much more likely to receive it. What we experience outside of ourselves is often a reflection of whatever we are experiencing within ourselves. If we are not feeling supported by others, then it is likely true that we may not be supporting ourselves. The key to shifting this is to find ways to feel full and supported within ourselves instead of focusing solely on what we want from others. This was something I needed to do when dealing with various health issues. For a few years, I failed to address my health problems, which meant others couldn’t support me either. I would not stay committed to diet and lifestyle changes that I knew would help me. This meant others didn’t have the opportunity to support me because my actions did not show that improving my health was important to me. Ask yourself: Am I supporting my body when it’s sick or tired by letting it rest? Do I support myself by finding time to do the things that I love to do? Do I give myself the things I know I need—like going to doctor’s appointments when I’m sick or finding a therapist when I’m going through a difficult time? Then take it a step further and ask yourself: Am I really “myself” when around others? Am I putting myself in relationships with people who truly accept me for who I am? Do I allow myself to share my authentic truth with others? If we want to be fully supported in all aspects of ourselves, we need to choose to be in relationships where we feel free to be our authentic selves. This might mean letting go of some relationships and releasing expectations that certain people will suddenly change and be supportive. By being in relationships with others who fully accept us, we are supporting ourselves. In order to experience the highest degree of love and support in our relationships, we have to really love and support ourselves. So look within and become the master of your own self-care and self-love.